It's fairly obviously describing the creation of the universe, under the Ptolemaic model, with the Earth at the center, surrounded by the crystalline spheres containing the seven planets (Moon, Mercury, Venus, Sun, Mars, Jupiter, and Saturn), then sphere of the fixed stars. Mouseover text in the original post should include the citation "James Tobin, July 1984". James Tobin was the 1981 Nobel Prize winner in Economics. Concerning soba, be sure to check the ingredients list. The cheap Korean soba I usually buy contains wheat flour, besides the buckwheat flour. So, what help do you need? Another factor influencing scaling for space probes is communications. For a typical high-gain parabolic antenna, the size of the dish depends on the required gain and on the wavelength used. And, as already mentioned, the available power for communications depends on the size of the power source. Topic: Winnie the Pooh song melody origins? Re: Winnie the Pooh song melody origins? Just saw the latest press conference from the New Horizons team. 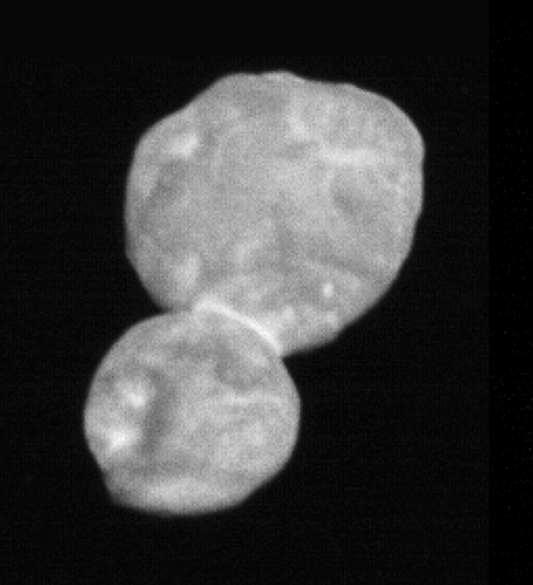 It appears Ultima Thule is a contact binary. The grey-scale pictures look like a snowman, except that (1) the color images show a reddish hue, and (2) it's a lot darker than any snow I would want to be associated with. I think actual, observed physics rules this out, but nothing logically prevents this from being the year "omega + 6000", where omega is the first transfinite ordinal. For the other view, I once had my freshman philosophy professor make the claim that tomandlu asked about. balthasar_s wrote: The planet closest to the sun? cool! I wonder which projection is used for maps there. NASA used a mix of Mercator for equatorial regions, Lambert Conformal for mid-latitudes, and Polar Stereographic for polar regions. Now I want a complete set of planetary and asteroidal atlases. And now we are seeing, in North Carolina, the problems with absentee ballots and people who don't follow the protocols. The oldest version of "all of a planet's life forming a single consciousness" I can find is Isaac Asimov's Green Patches, from 1950. The method of interconnection isn't specified there, however. Maybe they could package PBS and Voice of America into a new Department of Truth, after the fashion of the creation of the Department of Homeland Security. I think Congress would need to get involved. I get it. You two are talking about Formosa. Eutychus wrote: There's a much simpler solution to all this: never move. That still doesn't help if the empire you live under is dissolved. Lockheed Martin is developing part of the Orion Multi-Purpose Crew Vehicle. Specifically, the Command Module. The Service Module is being developed by Airbus. Indeed, what with inflation and all, I doubt you can buy beer so cheaply anywhere these days. Researchers are flying drones into supercells. It's only a matter of time until one gets caught up in a tornado. But these aren't quadcopters, they are fixed-wing aircraft with 10 foot wingspans. This is an advertising page, but it gives the specifications. If you can prove to people how you voted, you can more easily sell your vote. Similarly, other people can pressure you into voting a certain way, and into using a ballot selfie to prove you were compliant. As it is now, no one can expect you to back up any claim you make about your vote.